Gramatica s earliest surviving public commission, an old-fashioned configuration depicting Christ the Saviour with Sts Stanislaus of Krakow, Adalbert of Prague and Hyacinth Odrowaz, was painted for the high altar San Stanislau dei Polacchi. Very few works are definitely attributable to him. Archetypal heads, rhetorical hand gestures and contrasting lights and darks characterise his paintings. Datable c. 1619, early biographers ascribe to him The Dream of St Romuald painted for the high altar of the Eremo dei Camaldolesi in Frascati. Antiveduto painted many works for private clients in Rome and beyond, particularly in Spain. 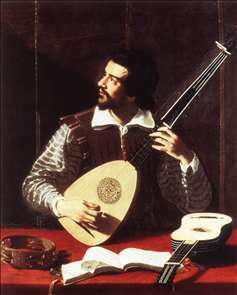 Characterized by Giulio Mancini as most zealous in his profession, Antiveduto began his association with the Accademia di San Luca in 1593, attaining the highest office of "principe" in 1624. Shortly after this, however, he became embroiled in scandal. The machinations of his enemy Tommaso Salini over his attempt to sell of the Accademia s altarpiece by Raphael brought about his demotion. 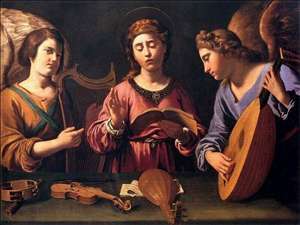 See more details about "St Cecilia with Two Angels"
See more details about "The Theorbo Player"